Why Claim Your Business on DealerRater? Founded in 2002, automotive website DealerRater is one of the leading car dealership review websites today, helping dealers create connections, inspire trust among automotive buyers, and sell more cars. DealerRater provides more than 4 million service and sales reviews across 41,000 U.S. and Canadian dealerships, including a national network of more than 6,000 certified dealers. 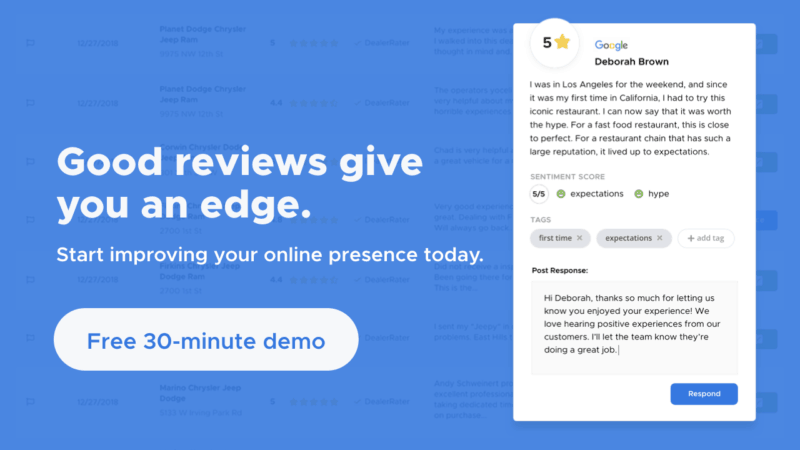 The reviews on DealerRater have a reachable audience of more than 31 million shoppers monthly, but each individual review is filtered through the site’s automated screening process, ensuring that every review is written by a real person, reflecting their real-life experience. If you’re managing a dealership or automotive business, DealerRater is one of the sites where you should claim your business and have a strong presence. Fortunately, the site offers a product suite that allows qualified dealerships to manage their online reputation and achieve higher SEO rankings. Planting your flag on DealerRater is easy. Basic Listing: The first option is to sign up for Basic Listing access. A Basic Listing account is a free account that allows you to claim your dealership listing on DealerRater and utilize features like the ability to respond publicly to reviews, update your dealership listing and contact information, and even tag employees on reviews. This will take you to DealerRater’s Dealers page. Scroll to the bottom of the page, and click “Claim Your Dealership Now”. Enter the name of Your Dealership in the pop-up window which will open, and click the auto-fill listing for your dealership when it is displayed. Enter your contact information (first and last name, job title, and email address) in the spaces provided. Note that DealerRater will ask you to claim your listing with an account registered to your dealership email address. If you do not have access to an email address under your dealership’s domain, you will have to provide DealerRater with a contact at the dealership who can authorize your access. Click “Claim This Dealership” to submit your request. Your request will be routed to DealerRater’s Client Services Team, and you should receive notification that your request has been processed within 2 business days. Dealership Connections: The second option for claiming your business on DealerRater is by signing up for DealerRater Connections. A paid service, DealerRater Connections helps your dealership engage with potential customers, monitor your presence across the web, and promote your reviews, employees, and reputation across major search engines and automotive sites. DealerRater Connections gives you access to extra features like the ability to ask for reviews more easily with DealerRater’s LotShot tool, syndicate customer reviews to a network of millions, display your reviews in one place with an enhanced testimonial feed, allow shoppers to pre-select their salesperson, and make your listing stand out with premium ad placement.